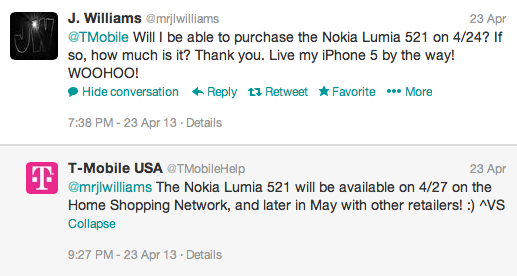 Yes, you read that title correctly as T-Mobile announced availability for the Lumia 521 this morning. Beginning April 27th, television retailer HSN will introduce T-Mobile’s exclusive Lumia 521 for $149.95 bundled with a car charger and screen protector. The Lumia 521 will also be available for $149 at Microsoft retail stores and Walmart on T-Mobile’s $30 no contract unlimited web and text plan. Mind you those prices are for the full retail price of the device, no contract required. The Lumia 521 is powered by Windows Phone 8 and features a 4″ display, 5 megapixel camera, 720p HD video and Nokia exclusive applications such as Nokia Music, Cinemagraph, Smart Shoot, HERE Drive, Maps and Transit. T-Mobile will partner with Nokia to bring customers the Lumia 521 – an exclusive to T-Mobile. Powered by Windows Phone 8, the Lumia 521, which will run on T-Mobile’s fast nationwide 4G network, is a perfect, everyday smartphone that will embody a range of high-end features at an affordable price. The Nokia Lumia 521 features a super sensitive 4” touch screen, 5MP camera with auto focus and 720p HD video recording. It will also include exclusive Nokia applications such as Nokia Music, Cinemagraph, Creative Studio, Panorama, Smart Shoot and HERE Drive, Maps and Transit. Beginning in May, the Nokia Lumia 521 will be available through Walmart, Microsoft Retail Stores and T-Mobile retail channels. Exact availability and pricing of the device will be shared at a later date. Hmm. I may buy one of these just because it’s so cheap. Does anyone know what size SIM it uses? Same. I’ve thought about taking a Windows Phone device for a spin… never wanted to shell out for a high end device though without the apps I’d want. Wouldn’t mind having one of these. That’s a SWEET price! I’m definitely going to buy one of these for my Mom. I am definitely getting one of these while I wait to see what Google and Apple does. The S4 doesn’t interest me because of the plastic and the HTC One is silver. Lg Optimus l9 is better then this. A flash for the camera has become a must for me. Crazy to me they would leave that off. Thanks for bringing up the flash feature. I had no idea it didn’t have a flash. I guess I won’t be getting this phone after all. I think so too. Did you get the update yet for your l9 (jelly bean)? I’m still waiting. Only thing is that low end Android phones usually are much more prone to issues with freezing and just running slow. I’m an Android person myself but if I had a limited budget then I’d get a Windows phone, because they run smooth whether it’s the flagship phone or the entry level. If I buy Android then I go with the higher end devices, unless you’re running AOSP ROMs. I worked at T-mobile for quite awhile and the low end phones were always an issue, plus LG is absolutely the worst for software issues. They make great hardware but they make great phones(G2X, Mytouch, Optimus) absolutely a nightmare for customer care reps.
Also, L9 from T-mobile is 60% more expensive than the Lumia. I agree with the camera flash. The flashlight is probably my most used app. That one costs nearly 300$, double the price of this phone. That’s retail price. We do not know the full retail price of 521, it is likely to be less. The L9 is $180 with free shipping at HSN right now, just look for it. Cashback is available too, I think 5% with Fatwallet, don’t know about other sites. This is a ridiculously low price for such a nice device. Why are there so many comments about getting this for your parents? lol, how old are some of you people? I feel OLD…wow. Am I the only 40+ member here at TMoNews? lol…where are my peers at? Represent…come on people!!! My parents use iPhones though…. Damn that’s a low price. It’s available on the website right now. No need to wait for the 27th. Just picked one up. Thanks! Wait how much? What? Really? I just found the perfect device for recommendations and purchase as gifts. This has WiFi, a camera flash, etc. Right? All the basics? No camera flash, which is a deal breaker for me. I don’t know about wifi though. Thanks for the heads up. I’ll make sure to warn about the flash. I haven’t seen the specs on this. Will it do HSPA on 1900? Thinking about buying it and trying it out on AT&T for a little bit. Though I could just activate my $30/5GB plan another month.